Every evening at Tienanmen Square in Beijing, the masses crowd around the Chinese flag as soldiers retire the ol' red and yellow for the night during a formal flag lowering ceremony. 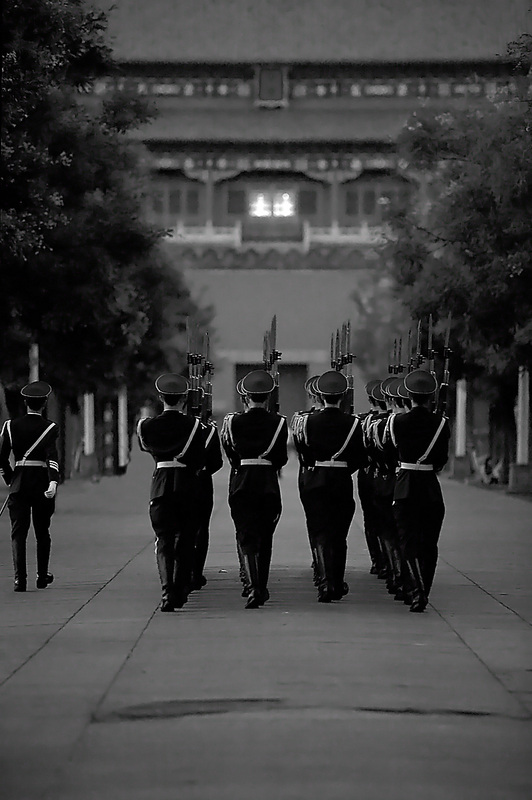 Afterward, the soldiers march through the tunnel underneath the large painting of Mao towards the Forbidden City. It's hard to get a clean background when there are several hundred people idly gawking so I waited on the other side of the tunnel away from the throngs of people to snap a clean image of the soldiers marching in perfect formation with the gates of the Forbidden City in the background. Bring a tripod. The light isn't so great in the evenings because of the high surrounding walls.